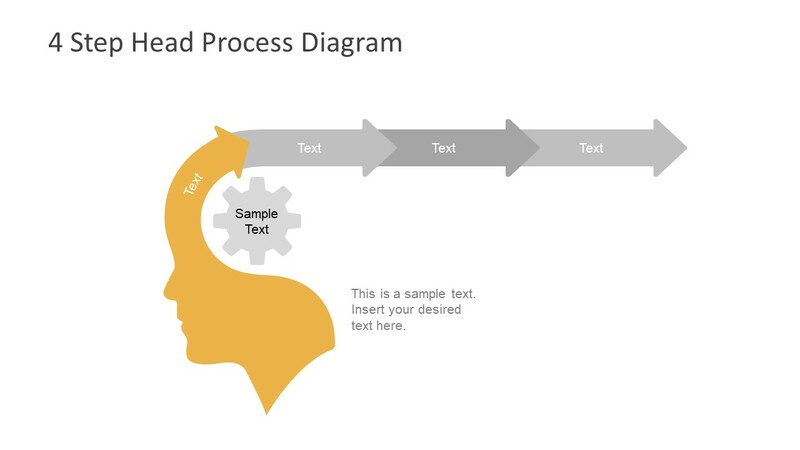 The Free Chevron Head Diagram for PowerPoint is a 4 steps horizontal timeline template. It is a flexible design of shapes and graphics adjustable according to specific needs of users. As a learning presentation template, the colorful chevron segments help to increase the audience’s attention. Whereas, in a professional environment, i.e. business meeting, chevron head diagram can illustrate the workflow of processes. Basically, the use of chevron shapes in the concept diagram creates the responsive visual atmosphere to make better decisions. The 4 steps process diagram shows the first segment as a human head silhouette turning into a chevron shape. 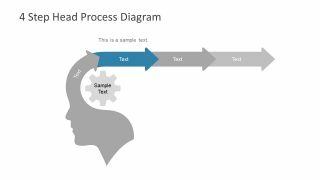 And the gear icon besides human head portrays a process. Hence, the diagram demonstrates the strategic thinking process to develop a logical workflow. 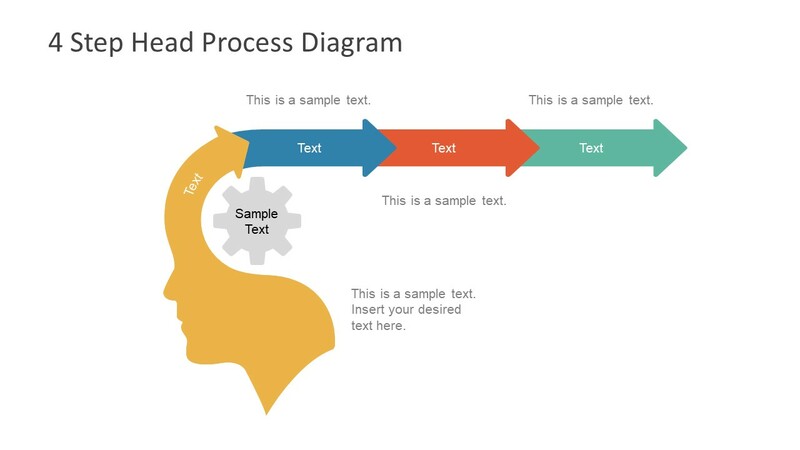 The 5 slides Free Chevron Head Diagram for PowerPoint is a simple layout of concept elaboration presentations. The step-by-step simple process flow diagram of visual graphics makes it easier for the audience to grasp the knowledge. According to a study, almost 75% of the population prefers information in graphics which makes it 3 of every 4 people. Therefore, the use of PowerPoint shapes and images can stay fresh longer in the mind of viewers. 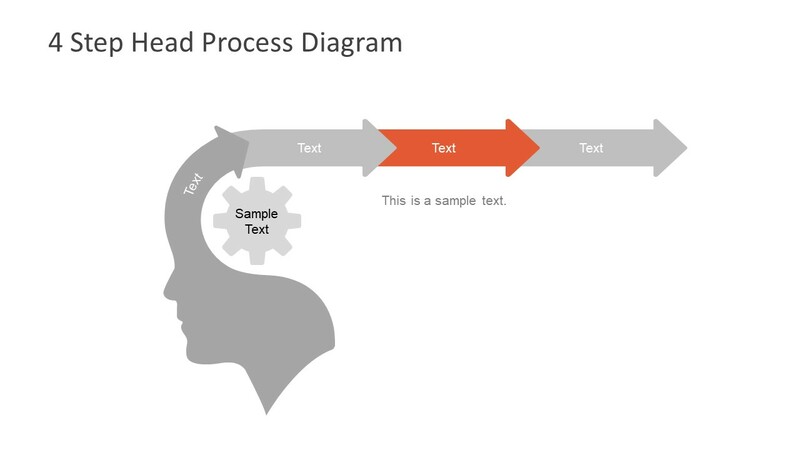 Further, the free PowerPoint diagram provides text placeholders on each slide to enter relevant content. The Free PowerPoint diagram with chevron head has one overview slide of multi-color segments. The following four slides, however, contain one color segment each while graying-out the other three. 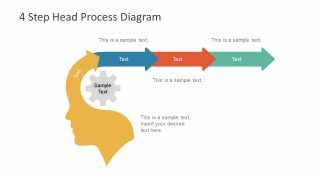 This style of presentation helps the audience to focus on one element of the topic at a time. These free slides also provide an empty space on the right slide where the user can insert placeholder or icons. Colors and size of shapes are customizable in few clicks. Moreover, add shape styles and effects to personalize according to the presentation theme. 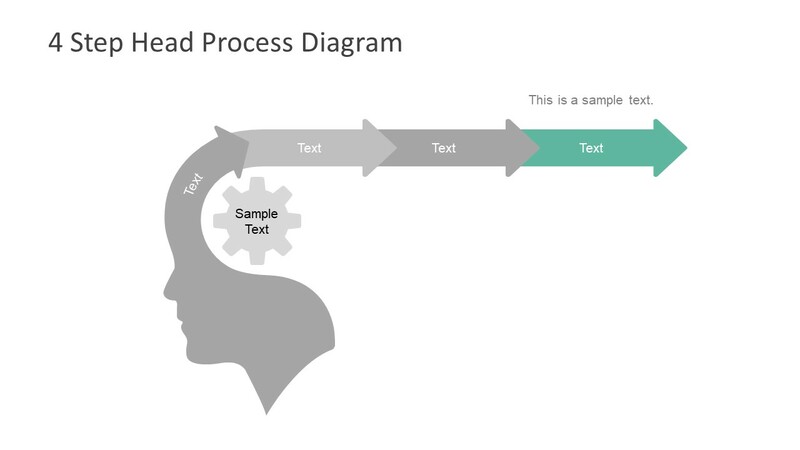 Follow this link to a 6 slide chevron process head diagram PowerPoint here with more slides.